HARTING is driving the development of the standardisation of the new Single Pair Ethernet (SPE) technology forward. Now, in a multi-stage selection process, international standardisation committees have decided in favour of the Technology Group’s SPE mating face. "We’re pleased with this decision. This also ensures planning security for the developers of new devices or sensor/actuator technology," as Ralf Klein, Managing Director of HARTING Electronics stated. Single Pair Ethernet is a new Ethernet technology that requires only one pair of wires (instead of four pairs) to transfer data and power. This technology, which is driven by the automotive industry, is also gaining increasing importance in automation technology, where its development is advancing in targeted manner. Thanks to its simplicity and an associated reduction in weight, space requirements and installation effort, a great future is seen for the technology within the industrial sector, automation technology and the rail industry, among others. SPE now makes it also possible to implement digitisation down to the field level, i.e. end-to-end IP-based communication. Equipping simple sensors or cameras, reader and identification devices, etc. with Ethernet interfaces supports the implementation of Integrated Industry and IIoT. Based on this mating face, HARTING is preparing a comprehensive product portfolio for the industrial sector. The technology had been driven forward in the past two years in close cooperation with customers. 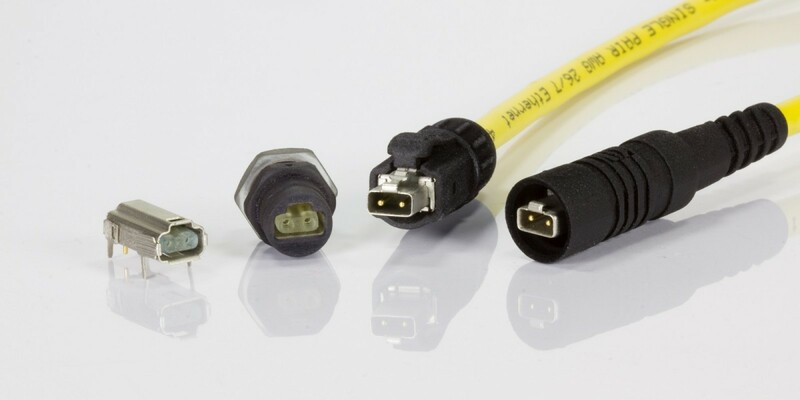 SPE connector concepts from HARTING were initially presented at SPS 2016 in Nuremberg.